Still in the grip of post-Tony fog, I’ll offer a few grumpy observations. Of course, there’s more to say, but we’ll leave it at this for now. Just because Hugh Jackman can hop for 10 minutes doesn’t mean he should, at least not on a telecast. (In general, as talented, cute, charismatic and energetic as Jackman is, he could really afford to relax a little – it doesn’t need to be jazz-hands every minute.) And please don’t ever sing the nominees again. How many gay jokes do we need in an evening, especially when they’re being riffed by the ostensibly straight Mr. Jackman? In other contexts, we call this cultural appropriation, and we disapprove. 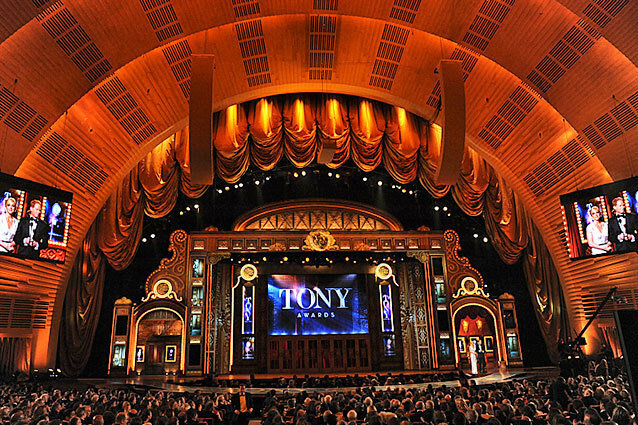 Every year, I’m more aware of how much the Tonys are in in the grip of financial interests. You can see it in the choice of presenters (some of whom have little or no Broadway experience, but do have bankable names), the nominees and winners – pretty much everywhere. What other explanation can there be to feature Jennifer Hudson singing a song from a show that 1) hasn’t opened yet, and 2) won’t involve her when it does? Or to invite Clint Eastwood, who has no Broadway credits and really shouldn’t be allowed outside without a nurse, but does have a film of Jersey Boys opening later this month? The chevron-configured phalanx of singing-and-dancing boxers who kicked off the Rocky number rendered parody absolutely unnecessary. It’s dispiriting that many wonderful actors, who for years have made the stage their home, seem inevitably to lose out to bigger names (and better-promoted shows). I’m not saying they all deserved to win their categories – but among this year’s group, I wish it didn’t seem like a foregone conclusion that Reed Birney, Tyne Daly, Tony Shalhoub, Mare Winningham, Danny Burstein, and especially Estelle Parsons (to name only a few examples) would go home empty-handed. Maybe the Tonys need to create a special subcategory for Mark Rylance, which would open the possibility that other deserving actors might someday win. In particular, given that Rylance et al have been playing their Twelfth Night production in multiple venues over a period of years, wouldn’t the better part of valor have been to withdraw from consideration? (On the other hand, I’m grateful Rylance gave an actual acceptance speech, rather than reading a greeting card, or his shopping list, or somesuch). The Cabaret revival, which I didn’t love the first time around (too much self-conscious grunge, which ultimately dilutes the power of the show) really looks tired now. It seems a strange kind of logic to award a New York theater with the “regional” Tony. The noise that Nikki James made in “I Dreamed a Dream” bears little resemblance to singing as I know it. This was the best I’ve heard Idina Menzel sound in a long time. It’s not a voice I love – more powerful than attractive – but it’s a star-sound, and I thought she sang with style and control. I loved seeing and hearing Jessie Mueller and Carole King together! I am amazed that despite having had a good time watching it, I am in TOTAL agreement w/ all your points!